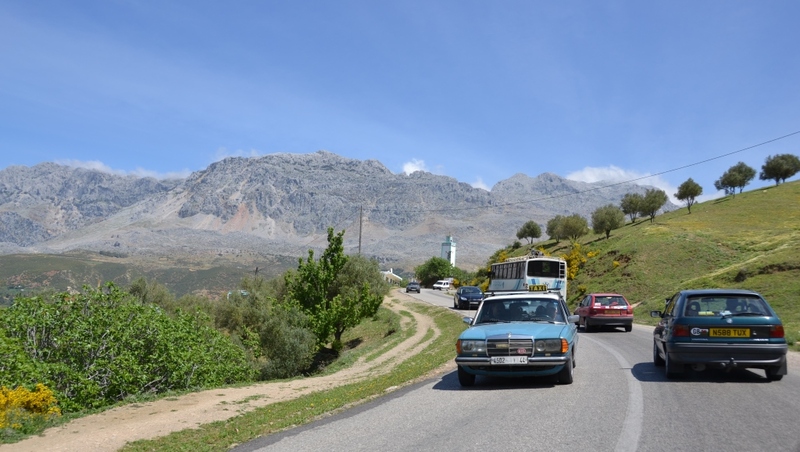 We had not expected the delays in cueta , we had not expected customs to take quite so long , so we were behind schedule getting into the journey, we had been warned about the rif valley, don’t go there, definitely don’t go at night, don’t speak to any one there and don’t stop. 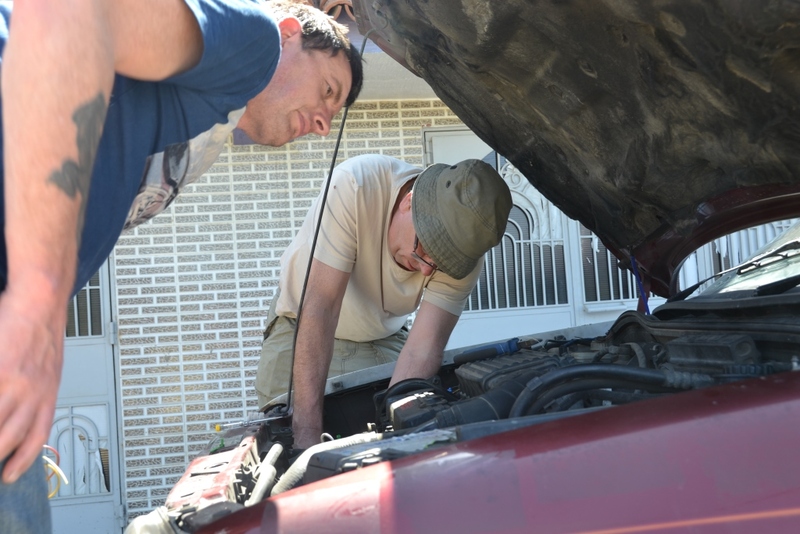 I knew that over heating was the Achilles heal of my car, I had tried and failed to solve the problem before we left and although I had made some more changes, I was not confident that the problem of overheating would not come back. 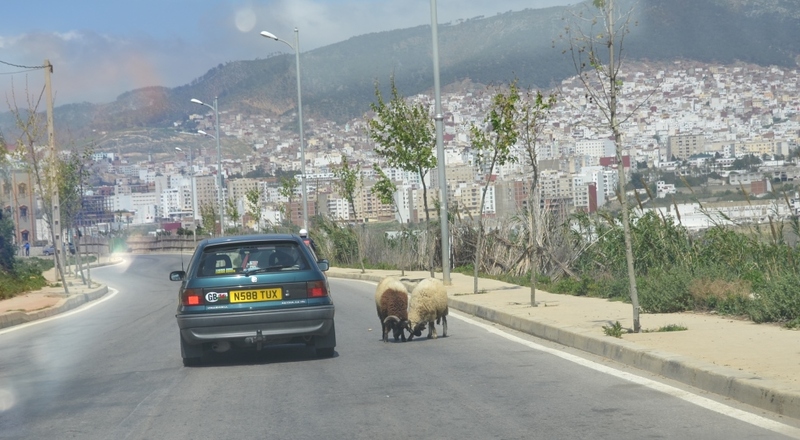 We had been fighting overheating in the foot hills of the rif mountains since we had started to climb, the solution was to put the heater on flat out and disperse some of the engines heat through the car. We had the sun roof open and the windows apart from the drivers window which was not working. On the way up into the mountains, we realised the engine was too hot, we had to stop, we radioed ahead to the team and pulled over. The engine was well out of its comfort zone. 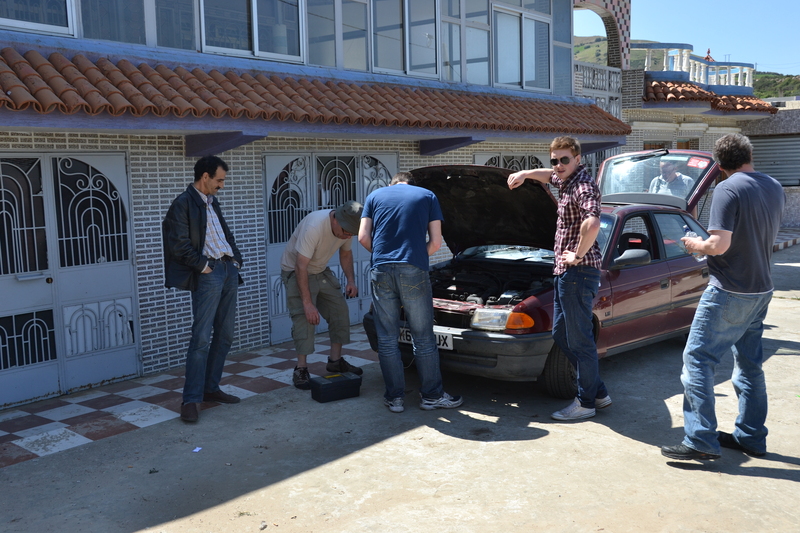 On pulling the bonnet, I had grave concerns for it. The electric fan had not kicked in despite having had a new switch fitted and as most of the climbing was slow, it was essential that we got it working. With a bit of wiring and messing about, we had bypassed the thermostatic switch and the fan was running. We set off again in the hope that this may be a solution. We had gone around 400 meters when it was clear things were not good, we stopped again and investigated. The top hose was pouring out water, not good because we had no spare. It seemed to be leaking around where it fits up to the thermostat housing. We removed the jubilee clip and then pushed the hose further on until it would go no further then we moved the jubilee clip as far along the hose as we could to try and contain the hole at the wrong side of the clip. We filled up the water and fired her up and all was well. No leaks, let’s get going, it later turned out that the mountain went on another 700 meters, we would not have made it to the top. The concern now is will the fan last ther trip. When we broke down at the the first location, we pulled in outside the house of a local drugs Barron, him and his co traders all came out to look at what we were doing, it was not an easy situation to be in, Jim was very nervous and we all wanted out, how ever there Was no trouble other than constant pestering to buy canabis resin. They waved us a fond fair we’ll and we went on up the hill. We drove on and on and the scenery was increasing spectacular, the car was going well and I had a better feeling about the trip, at about 1500 meters we started to drive through the most spectacular Forrest’s, the trees were almost as big as the redwoods at Leighton estate and they went on and on, just the shade we were looking for to make dinner. We pulled up in an area that seemed free from canabis traders and was fairly level. We had a well rehearsed routine at lunchtime, nick would cook the noodles, four packages and a small amount of water, Jim would boil the kettle for a brew and stir fried the veg and what ever else we had. We can be back on the road in ten unites at a push, I. Think we could beat macro olds for fast food and ours is prepped on site. Any way our attempt for a peacfull lunch was soon quashed by the canabis traders, they all arrived in there Mercedes Benz saloons and preceded to sit on the gras to talk to us and prepare there offer. In the end there was only two that stayed. I had a pot of olives similar to the ones you can get at castle kitchen , very good, so I offer the two young chaps the olives and they gratefully accepted, we all chatted about our lives and they told us a little about their trade, it takes 100 canabis plants to make 500grams of resin, I have no idea what it costs on the street in the UK. The one who was the senior of the two pulled a piece out of his pocket and offered it to us, it smelled amazing, I was carful not to touch it, the uk border police wipe down door handles on the cars then test the wipes for drugs. And we noticed that all our cars were marked on the way through possible when they knew we were going to morocco. Anyway time for some of Rebecca’s ( my daughters ) delicious fruitcake. Me and the ,farmer shared a piece ten he gave some to his fried and commented on how good it was. So Rebecca your cake must be good , Moroccan drug dealers can’t be wrong. In truth, they were decent chaps not dissimilar to any farmers around montgomery, just a differ ant product range. After lunch were got back on the road, I enjoyed the company and the food. On our way down from one of mountains, we were following a wagon full of large concrete drainage pipes. Nick and Andy had managed to get passed then Jim had a go, he got pased quite safely, we were next and we both believed we had spotted an opertunity, we made our move and had almost got past when a mercades taxi seemed to appear from nowhere heading straight for us, we were still on the wrong side of the road, there was no time to get over even though we were petty much passed the wagon, our only option was to head for the ditch on the Left hand side to avoid a major collision. We. Were in the worst place for an accident, we new it, the infrastructure is not there to sort us out or the car, and I fought if there is any law and order or ambulances in the riff valley, our hearts raced as we waited to see if the taxi driver would make the right move and also go on the wrong side of the road, that way we wouldn’t be hurt, he did, but we still had n o choice but to go off piste , it appears that the highways agency, conscious of the fact that ten time more road fatalities in Morocco than the worst European county, seem to leave generous run off area in many places along the way, it was our lucky day, this bend had a run off that allowed is to get into with low risk to the car. We drove out of the other side not feeling very good about or selve and hearts racing, won’t forget that one in a hurry. Two years ago I was fortunate. Enough to be able to do a road trip to the arctic circle and we came down through Norway on our way back. I have since said that Norway is the most beautiful place I have ever been, until now. The riff mountains and valleys are almost intensely buetiful the shear scale of them is awe inspiring, the winding roads that we drove over, seemed to go on forever and around each bend another spectacular view. The pie Forrest’s near the top are like nothing I have ever seen, and provide a refreshing shade to have lunch under, the cliffs and rock formations begged belief. I loved driving through the riff valley and mountains and I would do it again despite recommendations otherwise. I had written all this text once then my tablet died and I am now doing it all again but my excitement for the area is un diminished. Never drive through the riff valley at night, that was the next recommendation to break. The nearer the top of t he mountains we were the rougher the towns and villages became then when at the very top at around 1600m we drove trough a town that my simply knowledge of English can not adequately describe. You will have to look at the video when it goes live, it was like a scene from mad max croxssed with a refugee camp crossed with a town that law and order forgot. We locked our doors and drove through hoping not to break down. That is why not to drive through here at night and it was nearly dark and we had far to go befor we sleep. This has been the most extraordinary day of my life, I have been terrified, stressed, elated filled with amusement and relaxed, I have had my hart strings pulled by destitute children and starving donkeys an I have. Been delighted by the ordinary people we have met. I will never forget this day and I think my fellow travelers will feels the same way, but the day had two note worthy event to through at us. Think I very glad to be flying in !